Summer… the season of warm days and balmy evenings (we hope! ), seaside fun, cricket on the green, Wimbledon fortnight.. and juicy strawberries! Not forgetting the humble blackberry, of course. You can always enjoy the traditional strawberries and cream or bake a blackberry pie. But you can do so much more with them, and here are some recipes ideas to make the most of these berry, berry versatile fruits. 1Preheat the oven to 200°C/180°C fan/Gas mark 6. 2Roll out the pastry on a floured surface, then cut out a circle big enough to fit into each mini tart tin. 3Carefully lay the pastry discs into the tart tins and press gently into the corners. 4To blind bake the pastry lighlty prick the pastry bases with a fork then bake for 20-30 minutes until cooked thouroughly. 5Hull and halve the strawberries and mix in a bowl with the black pepper. 6Chop the rosemary and mix with the strawberries. 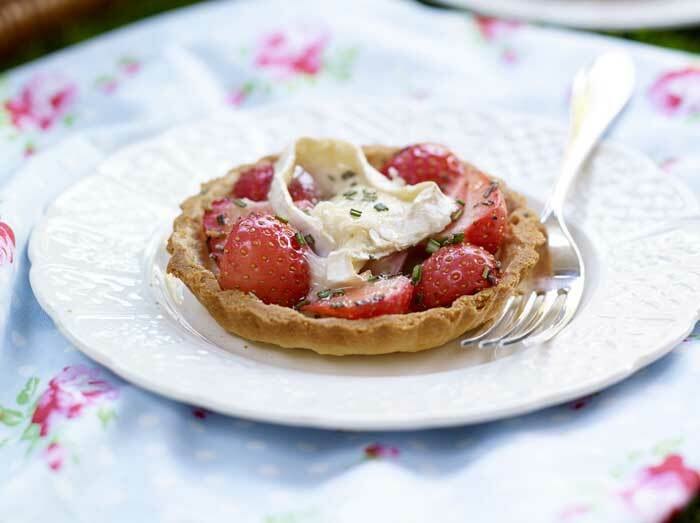 7When the tart cases are ready, spoon in the strawberries and then add a slice of goats’ cheese on top of each one. 8Place the tarts back in the oven for 10 minutes until the cheese has melted and bubbled. 9Remove from the oven and allow to cool slighlty before serving. Sophie says: “I love spices and these tacos are a great flavour combination. They are also a fun way to get children involved in food as they can build their own Tacos, and make a really great addition to a BBQ too. The salsa is also a great healthy alternative to sugar-filled, shop-bought BBQ sauces and the chilli even gives your metabolism a boost.” Recipe by BerryWorld. 1First make the salsa, then it can sit marinating for a while. 2To do this, dice the strawberries and avocados into roughly the same sized pieces (just under 1cm square) then mix with a squeeze of lime juice. 3Next, finely dice the red onion and the jalapenos and mix with the strawberries, avocados and a handful of fresh coriander. 5For the prawns, first make the spice mix by stirring the spices with the chopped garlic and adding to the olive oil. 6Next, de-head the prawns and take out the black line on their back, then cover the prawns with the spiced olive oil. 7Season and set aside. For the prawns, first make the spice mix by stirring the spices with the chopped garlic and adding to the olive oil. 8Next, de-head the prawns and take out the black line on their back, then cover the prawns with the spiced olive oil. 9To heat the tacos, either dry-fry them or wrap them in foil and place in the oven at 200°C/180°C fan/Gas mark 6 for 10 minutes. 10To cook the prawns, place on skewers and BBQ the prawns for about 2 minutes each side (depending on thickness). 11The meat should turn white and the outside should turn pink. 12To serve, place a couple of tacos on each plate, pile in the prawns and salsa, then serve with salad and the limes on the side. This exciting yet light dessert is made in minutes, but best not assembled until you are ready to serve. Recipe by BerryWorld. 1Preheat the oven to 190C/375F/gas mark 5. 2Grate the zest finely from the lime and orange and squeeze the juices into a medium size pan. 3Add the sugar and warm through until it has dissolved. 4If the pears are quite firm cook them for 2-3 minutes in the syrup to soften slightly. 5Transfer to a plate to cool. 6Add the blackberries and cook for only 1 minute. 7Remove from the heat and cool. 8Put four brandy snaps on a non-stick baking tray. 9Bake for about 1 minute or until flattened out into neat circles. 10Cool until firm enough to transfer with a fish slice to a cooling rack. 12Spread twelve of the brandy circles with the mascarpone, arrange four on serving plates and carefully layer up the drained fruit (save the juices) with the rest of the biscuits and mascarpone. 13Simmer the juices for a minute or two until syrupy and pour around the tier just before serving with a sprig of mint.